Whether you’re new to rubrics, or you just don’t know their formal names, it may be time for a primer on rubric terminology. So let’s talk about rubrics for a few minutes. 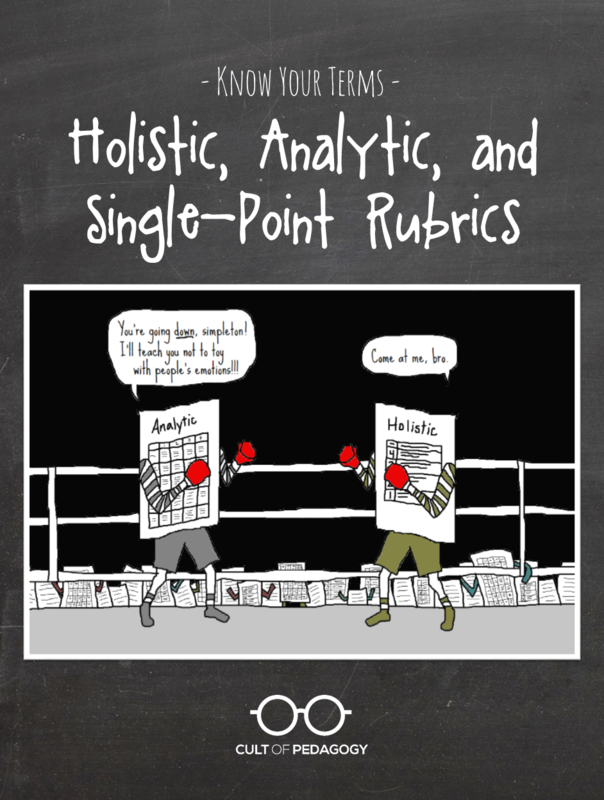 What we’re going to do here is describe two frequently used kinds of rubrics, holistic and analytic, plus a less common one called the single-point rubric (my favorite, for the record). For each one, we’ll look at an example, explore its pros and cons, and provide a blank template you can use to create your own. A holistic rubric is the most general kind. It lists three to five levels of performance, along with a broad description of the characteristics that define each level. The levels can be labeled with numbers (such as 1 through 4), letters (such as A through F) or words (such as Beginning through Exemplary). What each level is called isn’t what makes the rubric holistic — it’s the way the characteristics are all lumped together. The main advantage of a holistic rubric is that it’s easy on the teacher — in the short run, anyway. Creating a holistic rubric takes less time than the others, and grading with one is faster, too. You just look over an assignment and give one holistic score to the whole thing. The main disadvantage of a holistic rubric is that it doesn’t provide targeted feedback to students, which means they’re unlikely to learn much from the assignment. Although many holistic rubrics list specific characteristics for each level, the teacher gives only one score, without breaking it down into separate qualities. This often leads the student to approach the teacher and ask, “Why did you give me a 2?” If the teacher is the explaining kind, he will spend a few minutes breaking down the score. If not, he’ll say something like, “Read the rubric.” Then the student has to guess which factors had the biggest influence on her score. For a student who really tries hard, it can be heartbreaking to have no idea what she’s doing wrong. Holistic rubrics are most useful in cases when there’s no time (or need, though that’s hard to imagine) for specific feedback. You see them in standardized testing — the essay portion of the SAT is scored with a 0-6 holistic rubric. When hundreds of thousands of essays have to be graded quickly, and by total strangers who have no time to provide feedback, a holistic rubric comes in handy. An analytic rubric breaks down the characteristics of an assignment into parts, allowing the scorer to itemize and define exactly what aspects are strong, and which ones need improvement. In this case, you’d give your loved ones a separate score for each category. They might get a 3 on Presentation, but a 2 on Food and just a 1 on Comfort. To make feedback even more targeted, you could also highlight specific phrases in the rubric, like, “the recipient is crowded during the meal” to indicate exactly what went wrong. This is where we see the main advantage of the analytic rubric: It gives students a clearer picture of why they got the score they got. It is also good for the teacher, because it gives her the ability to justify a score on paper, without having to explain everything in a later conversation. Analytic rubrics have two significant disadvantages, however: (1) Creating them takes a lot of time. Writing up descriptors of satisfactory work — completing the “3” column in this rubric, for example — is enough of a challenge on its own. But to have to define all the ways the work could go wrong, and all the ways it could exceed expectations, is a big, big task. And once all that work is done, (2) students won’t necessarily read the whole thing. Facing a 36-cell table crammed with 8-point font is enough to send most students straight into a nap. And that means they won’t clearly understand what’s expected of them. Still, analytic rubrics are useful when you want to cover all your bases, and you’re willing to put in the time to really get clear on exactly what every level of performance looks like. A single-point rubric is a lot like an analytic rubric, because it breaks down the components of an assignment into different criteria. What makes it different is that it only describes the criteria for proficiency; it does not attempt to list all the ways a student could fall short, nor does it specify how a student could exceed expectations. Notice that the language in the “Criteria” column is exactly the same as the “3” column in the analytic rubric. When your loved ones receive this rubric, it will include your written comments on one or both sides of each category, telling them exactly how they fell short (“runny eggs,” for example) and how they excelled (“vase of flowers”). Just like with the analytic rubric, if a target was simply met, you can just highlight the appropriate phrase in the center column. If you’ve never used a single-point rubric, it’s worth a try. In 2010, Jarene Fluckiger studied a collection of teacher action research studies on the use of single-point rubrics. She found that student achievement increased with the use of these rubrics, especially when students helped create them and used them to self-assess their work. The main disadvantage of single-point rubrics is that using them requires more writing on the teacher’s part. If a student has fallen short in many areas, completing that left-hand column will take more time than simply highlighting a pre-written analytic rubric. Know Your Terms is my effort to build a user-friendly knowledge base of terms every educator should know. New items will be added on an ongoing basis. If you heard some term at a PD and didn’t want to admit you didn’t know what it meant, send it to me via the contact form and I’ll research it for you. This is an awesome, thoughtful post and idea. I’m using this in my class with a final project the kids are turning in this morning. I’m excited about the clarity with which I can evaluate their projects. I’m so glad to hear it. If you’re willing to share what you made and tell me how it all went later on, I would be thrilled to hear it. Rubrics are great tools for making expectations explicit. Thanks for this post which gives me some vocabulary to discuss rubrics. Though, I could use some resources on rubric scoring, b/c I see a lot of teachers simply adding up the number of squares and having that be the total point value of an assignment, which leads to incorrect grades on assignments. I’ve found some converters, but haven’t found a resource that has the math broken out. Thanks for the feedback, Jeremey! You are not the first person to request a clearer breakdown on the math for this rubric (or others), and you’re right, teachers definitely have different approaches to this. I have some good ideas on this, so I will plan a post on it for the near future. There is no such thing as an appropriate converter. Levels are levels and points and percentages are points and percentages and never the twain should meet. Years ago, Ken O’Connor was the person who turned my grading around. For that reason, I would be against using the “0-80%” or “0-80 points” piece. O’Connor is very clear about how grades below 50 ruin a grade average. I would love to be able to grade with standards only, but what I do instead, to fit into our district grading software, is to grade by standards (using letters, where “proficient” is a “B”), and the traditional letters are equal to 95/85/75/65/55. That gives kids a chance if they ever somehow earn only a F. It doesn’t kill the rest of their grade. This post was so helpful! I am struggling right now with assigning Habits of Work grades to my Spanish students in middle and high school. I was using an analytic rubric for both my assessment and the students’ self-assessment, but it’s possible the quantity of words was exacerbating the problem of students scoring themselves in the best column out of reflex or habit. I’m going to try a single-point rubric to see if that can lead us to some more reflective thought. LOVELY post. So didactic and useful. After reading some quite dense posts on rubrics, I’ve enjoyed this a lot. You have now convinced me to use rubrics! THANK YOU Jenny and CONGRATS!!! I have not seen or heard of single point rubrics. I’m really excited to try that out. Less wordy and easier for students to see what is expected of them and get meaningful feedback. Oooh! I never thought I’d like a post on rubrics, but this was awesome! Thanks for your great explanations. 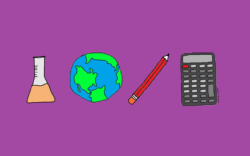 I’m currently working my way through your Teacher’s Guide to Tech/Jumpstart program and I wanted to take a minute and tell you how much I appreciate your site and podcasts too. Everything is so concise, interesting and helpful! Sariah, thank you!! I haven’t gotten a ton of feedback on the JumpStart program, so it’s really nice to hear that! Let me know if you have any questions! I am Master of Mathematics Education student and I am busy compiling my assignments on rubrics. Your notes are well explained and straight to the point. However, my Professor have instructed as to look up on primarily rubrics and multi-trait rubrics that i seems not to get. Do you care to differentiate them for me? Thank you. It seems to me that a primary trait rubric focuses on a single, somewhat broad description of how well the student achieved a certain goal. Multi-trait rubrics allow teachers to assess a task on a variety of descriptors. To me, the primary trait seems very much like the holistic rubric, and the multi-trait rubric seems a lot like an analytic rubric. If anyone else reading this knows the finer points of the differences among these four, I would love to hear them! How to better calculate a grade with a rubric. Please see: http://tinypic.com/r/2dl6d5c/9. Thank you so much for this humorous and informative approach to rubrics. It seems to me that the single-point rubric, which I agree makes the most sense for assignment specific rubrics, is really just a clear set of assignment instructions / expectations with the addition of over/under columns to make it rubric-ish. I love to have students help create rubrics. By the end of the year, we often create the entire rubric together as a class, but often I allow them to start by assigning one “open” section that they think I should grade on for which I help them write “exceeds, meets, doesn’t meet” standards. Then we move on to them assigning points for each standard that I’ve written (this is fascinating for me to see what they weight more heavily), and finally on to writing their own categories for which I write the standards, and then we reverse so that I write the categories and they write the standards. I give a lot of writing and speaking assignments and they really like being involved in how and what and how much we grade. (I never find they are too easy on themselves, either.) I love the single-point rubric especially for assignments I come up with off the cuff and don’t have time to write an elaborate rubric for! If you’re moving away from traditional grades, the single-point rubric is a perfect instrument for delivering specific feedback. This is a great site and I really liked the one example used with the multiple rubric styles so we could really understand the difference in them. I am confused about the difference between a Single Point rubric and a Primary Trait rubric. You didn’t mention the Primary Trait rubric so I am wondering if they are the same. 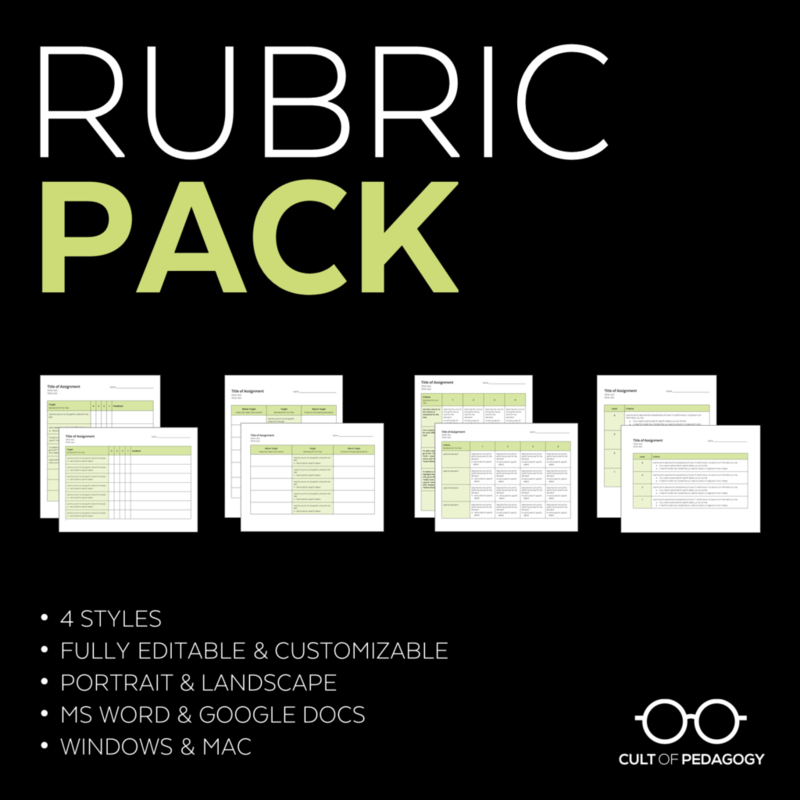 Thank you for succinctly explaining the types of rubrics and THANK YOU for the free downloadable templates. I will share them with my education senior students!!! AWEsome work you have done. You are very welcome, Alberta! Thank you for the detailed information. I have been using single point rubrics from last year and I love them, but do you think we should give students a checklist as well? If so, what should it look like? I don’t want to kill their creativity, though. I think the rubric can contain a checklist if you want students to include specific things in their end product, or you could do a separate checklist, then add something like “all items from checklist are included” in your rubric language. There is definitely a gray area here: Defining requirements too narrowly could stifle creativity, but it’s also important to be clear about expectations. Really appreciate this post! Thank you. I have used the analytic approach, but I can really see the benefits of a single-point system. Thanks for your clear explanation. Saying that ‘analytical’ rubrics are difficult and time consuming to write is true, but is also a cop-out. Taking the time to clearly define and articulate student behaviours at each level promotes student independence and self-assessment, and results in better outcomes. The fact that students have departed from what’s written on your rubric suggests that either the assessment wasn’t explained well enough or the rubric itself is of poor quality. The analytical rubrics provided here fall well short of quality rubric standards. I would suggest reading Patrick griffin’s Assessment for Teaching, and visit the ReliableRubrics websites for good examples. Thanks for the book and website suggestions, Martin. I do think it’s possible to construct a clear 4-column analytical rubric, but I have rarely seen one that manages to cover all the bases. The ones that DO cover every possible outcome are often insanely long. I’m thinking of some I got in grad school that were–I kid you not–several pages long and written in 9-point font. Despite the fact that I am a diligent student, even I got to the point where I threw in the towel and stopped reading the whole thing. Instead, I just gave my attention to the “3” and “4” columns. I’m guessing that other students do the same thing. If our goal is to have students understand what’s being asked of them and to pay attention to the details, why spend so much time on defining what NOT to do? Thank you Jennifer, I have shared this with fellow colleagues in Costa Rica. I know this will be of great use!! Thank you for this work. Your site has been very helfpul to me. Thank you so much Jennifer! You seem to be an expert in making rubrics! I really appreciate the simplicity of the delivery of your thoughts about rubrics. I just want to ask if there is such a rubric for a cooperative activity? I am Geraldine, by the way, and me and my classmates are planning to conduct cooperative listening activities among Grade 8 students. We are having a hard time looking for a rubric that will assess their outputs as a group. Can you suggest one? Your response will be of great help. Thank you so much. May God bless you more and always! Hi Geraldine, I work with Cult of Pedagogy and although we can’t think of anything specific to what you’re looking for, I’m thinking you might want to check out our Assessment & Feedback Pinterest board — there are a ton or resources that might help you create a rubric that would be specific to your needs. The most important thing is to identify what you want students to be able to do in the end. For example: listen to others with eye contact. (Be sure to check out Understanding by Design.) Then you can choose a rubric structure that will best fit your needs and provide effective feedback. Other than that, you might be able to find some great ideas through a Google search. Well, thank you so much! May God bless you! Great information. Can you tell me how you come to a total/final score on an analytic rubric if the student receives a variety of scores in the different categories? Thanks. This is a great question! I’d check out Jenn’s post, Speed Up Grading with Rubric Codes. Even if you don’t use the codes, you’ll see in the video how an overall score can be given to a paper, even when scores in indivual categories vary. Basically the overall score reflects where most criteria have been met, along with supportive feedback. Hope this helps! 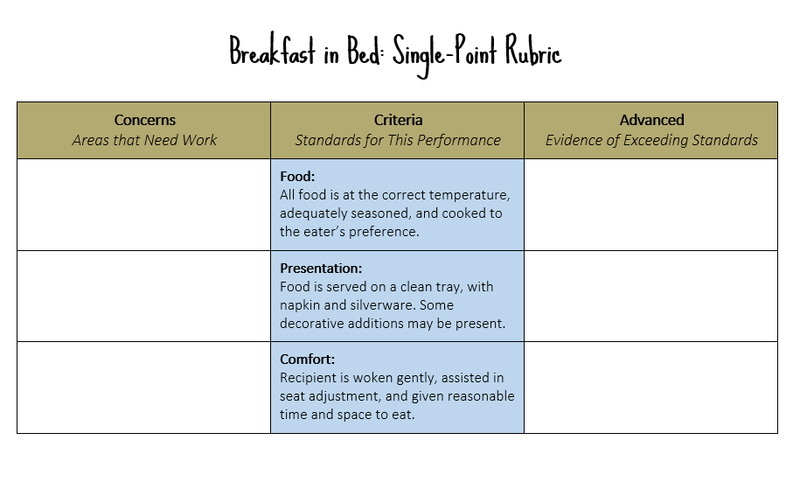 I loved the all of the rubrics you created for “Breakfast In Bed”. Your topic was an awesome analogy for teacher created tasks. 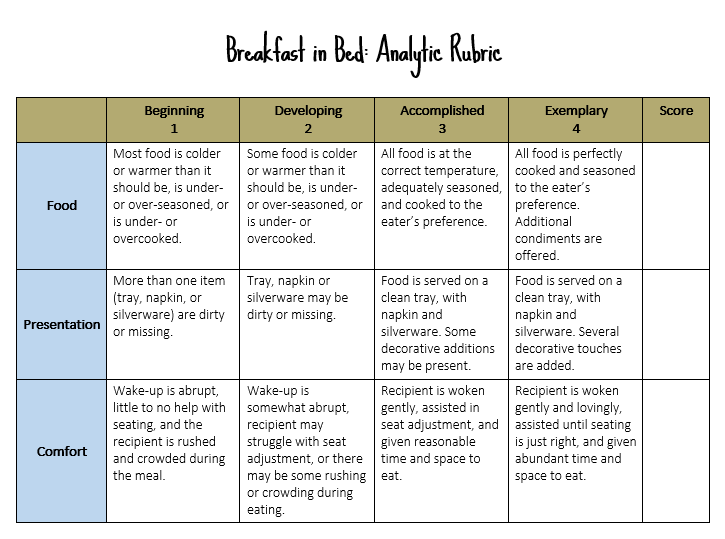 I personally prefer the analytic rubric because I believe it gives the most accurate feedback to the student. If you feel more information is needed, you could expand the categories in the rubric, for example in this case, you could add a column called “sensory enhancements” , such as music or table setting. If you want to add a more personal comment you can always add it in the margin. This issue has always frustrated me. I have recently been a HUGE proponent of holistic rubrics, but I do see the disadvantage of the feedback issue. For my first time teaching college composition, I used analytic rubrics–and hated them. It wasn’t the making rubrics that was time consuming, but determining how to break up the points and how to assign earned points for a paper. I would score a paper, add up all the points, and realized the paper got a B when, in reality, I knew it was a C-level paper. So I would erase and recalculate until I got the points I thought were more accurate. It took FOREVER!!! After some research, I decided to move to a holistic rubric, and it made grading way faster, but more importantly, I thought the numerical grade was much more accurate and consistent. (Score 6 would get a 95, 5 would be 85, etc., and I would give + or – for 3 more or less points). For feedback, I would annotate and underline/circle the parts of the criteria that they struggled in or did well in and left an end comment. And while I had them turn in a draft that I would give feedback on, I didn’t use the rubric for the draft feedback. Just comments on the paper. I’m willing to try to single-point, but to get to that final numerical grade (since a no-grade classroom isn’t allowed, unfortunately) you’d still have to break down the points arbitrarily like an analytic rubric. Who’s to say that “structure” should be 30 points while “grammar” should be 10? What’s the actual difference between a 40/50 in “analysis” and a 42/50? My grading PTSD is resurfacing just thinking about grading essays that way. 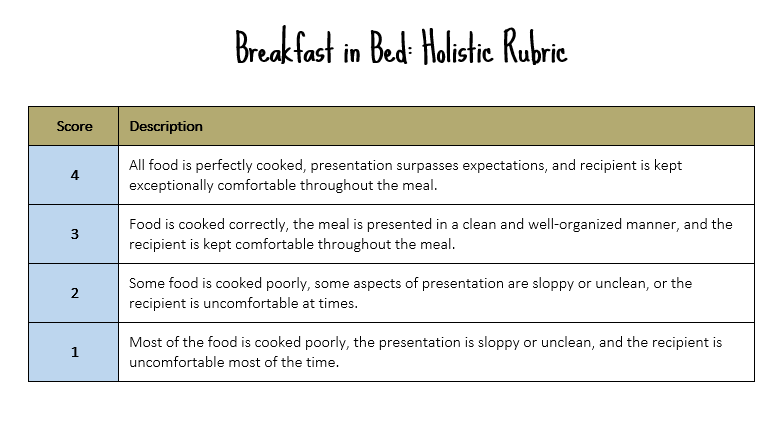 But at the same time, I also don’t like the limited feedback of the holistic rubric.